In large bowl, mix melted butter and soy sauce. Add carrots; toss to coat. Using tongs or slotted spoon, transfer to pan in single layer. Add pork to bowl with mixture; turn to coat. Add to pan with carrots. Pour remaining butter mixture over pork and carrots. Roast 25 minutes. Meanwhile, in small bowl, mix brown sugar, lime juice and and chile garlic sauce. Add edamame to pan. Drizzle whole pan with lime juice mixture. 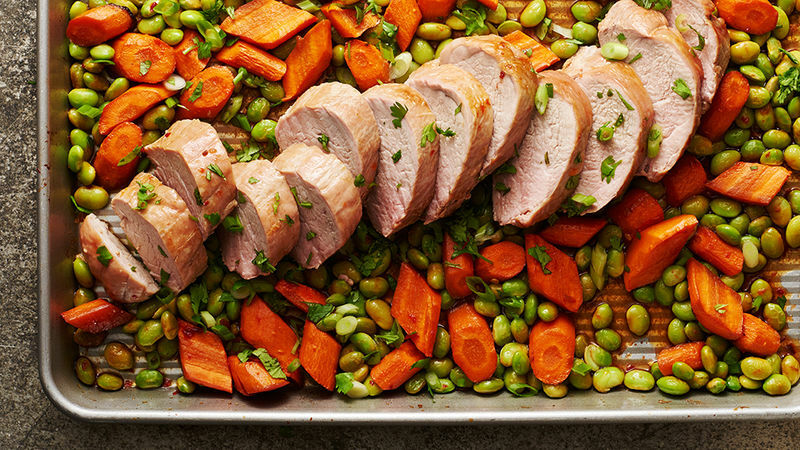 Return pan to oven; roast 8 to 10 minutes longer or until pork is no longer pink (145°F) and carrots are fork-tender. If your carrots are super skinny, cut into larger 2-inch pieces to prevent overcooking.